FORTUNE -- Ford famously avoided the taint of government bailout by heavily mortgaging itself in November 2006 -- down to its iconic Blue Oval logo -- before global credit markets seized. And the American icon has seemed to stay ahead of hometown rivals Chrysler and General Motors ever since. Alan Mulally, CEO since 2006, has pulled a deft series of maneuvers destined to make for closely scrutinized B-school case studies. He shutdown or sold money-losing brands like Mercury and Jaguar. He saved the well-known Taurus badge and introduced a raft of hot-selling small cars, steering the company away from its overreliance on inefficient, truck-like vehicles. He even managed to resurrect the once popular but accident-prone Explorer as a safe, gas-sipping crossover. On July 26, Ford (F, Fortune 500) announced that revenue jumped 13% to $35.5 billion in the second quarter, as the number of vehicles sold globally rose 7% and, crucially, prices increased. That puts Ford at center stage of a quickly unfolding drama where -- for once -- it is significantly disadvantaged compared to its rivals. Ford wants to put itself in a position to capitalize on hard-won gains as GM and Chrysler got back on their feet. The UAW, meanwhile, wants to reverse its diminished role in the U.S. auto industry. 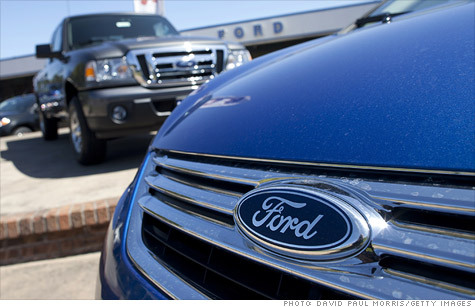 Ford is the one company with which a UAW cowed since 2009 can still play hardball. "Ford is the most likely to get whacked, because Ford is doing the best of the three companies," says a U.S.-based executive of a foreign automaker. "Mulally got the fattest pay package. And don't forget, the government saved Chrysler and GM, in part for the sake of the union, so it would be ungrateful, if not incredibly self-destructive, for UAW to put the squeeze on those two." Bob King, UAW president, presides over a labor union that's shrunk to a third of its historic size. He has few prospects unless he can manage to organize one or more of the transplant manufacturers that are clustered mostly in right-to-work states across the southern U.S. In just the past five years, Ford's UAW work force alone has declined to about 41,000 from about 100,000. Volkswagen AG is the latest foreign automaker to open up shop in U.S., earlier this year in Chattanooga, Tennessee. VW, like BMW and Hyundai, pay smaller salaries and have a fraction of the labor costs. But VW's German plants are organized by the metalworkers union, so the UAW may view that relationship as a wedge that could help it gain recognition in Tennessee. An acrimonious UAW strike against Ford -- the first in more than 30 years -- would be anathema to its plans in the south. More than 80,000 workers applied for a few thousand VW jobs in Chattanooga; the winners in that lottery aren't likely to be interested in joining a union, much less one party to a recent work stoppage. Still, King and his team of UAW negotiators must bring some increase in pay or benefits to his members -- otherwise they may ask themselves why they are they paying union dues each month. Ford, which declined to comment on the record for this story, is thought to be seeking a greater share of health-care costs be paid by UAW workers and their families. According to the automaker's own data, UAW members pay about 5 percent of the cost of health care, compared to 30 percent of the cost paid by Ford's salaried staff. In return, Ford is willing to improve profit-sharing, making it simpler and more dependent on factors like quality and workplace efficiency -- rather than purely on how much the company earns. Ford says its labor costs, including benefits, are about $58 an hour, 16 percent more than the going rate at Toyota's and other U.S. transplants. Aaron Bragman, an analyst for IHS Global Insight in Northville, Michigan, notes that "Ford can maintain what it's got in these negotiations, but it can't win anything new. Even maintaining what it's got will be a win. I'm not sure the UAW leadership is bent on a strike. If it happens, it probably will be short and symbolic." The complications could begin close to contract expiration in September if an impasse at GM and Chrysler results in binding arbitration, the resolution method agreed upon by the UAW in 2009. An arbitrator could impose a solution on rivals that wouldn't be acceptable to Ford. The union then might have to risk a strike or accept an end to the so-called "pattern" contracts designed to keep labor-cost parity among Detroit automakers. And that could put Ford in the toughest spot it's been in since 2006. On balance, even a bloody UAW strike would be better for shareholders -- especially the Ford family -- than bankruptcy and recapitalization under the thumb of the U.S. Treasury Department would have been. Ford continues to benefit with consumers who prefer to buy vehicles that aren't perceived to have been created as a result of Washington D.C. tinkering. Ford has performed heroically, fighting back from the brink on its own steam. Now the law of unintended consequences could bite, as the company becomes a potential punching bag instead of Chrysler or GM. It took some time, but Ford may have finally found the down side of going it alone.